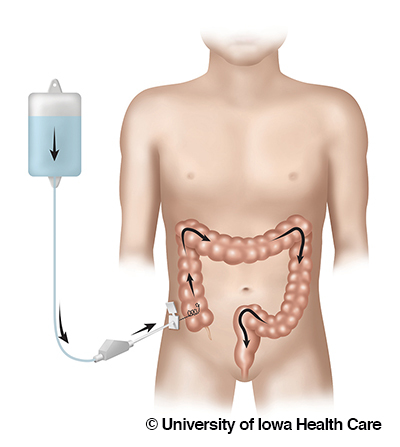 A cecostomy tube is placed in your child’s belly and connects to his intestine. It is used to flush stool out of the intestines. There are two main goals of using a cecostomy tube. The first goal is to have the bowel routine take less than one hour. The second is for your child to have no stool accidents in between flush times. If one or both of these goals are not met, we need to change your flush volumes. A cecostomy tube needs to be changed every 6-12 months. These are changed in the Pediatric Specialty Clinic. Sometimes your doctor needs to give your child some medicine to make him or her sleepy for this tube change. This is only needed if your child is very nervous about the tube change. The skin around the cecostomy tube needs to be cleaned every day. Use soap and water and wipe around the tube site. This removes any drainage or stool. It may help to use a cotton-tip applicator (Q-tip) or the corner of a washcloth. Your child can do all activities with a cecostomy tube. Your child may play sports, go swimming, and wear seat belts. You may think about keeping the cecostomy covered with a bandage. This is important to make sure the tube does not get caught on clothing or straps. If it gets caught, it could be pulled out. If your child will be swimming, cover the tube with a Tegaderm, or other occlusive bandage. 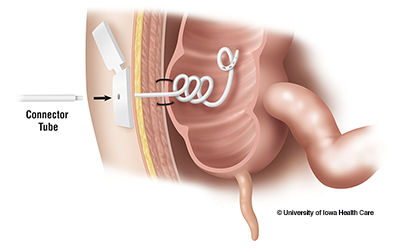 If the tube gets pulled out, it is important to place a catheter in the tract at home. You will be given a catheter to use. This will prevent the tract from closing before another cecostomy tube can be placed. After you place the catheter, call the Pediatric Surgery Team right away (see numbers below). Keep using your child’s previous bowel regimen for the first few weeks after cecostomy tube placement. The cecostomy tube can be used one week after placement. However, your routine may not be normal for several more weeks. Your child’s cecostomy flush has two parts. The first part is glycerin a glycerin flush. Glycerin helps muscles in the intestines to start moving stool through the colon. The second part is a saline flush. Saline helps to push out all the stool. Hook the extension tubing to the cecostomy tube. Flush in the glycerin/saline mix. Flush in the rest of the saline. Wait until your child is no longer stooling. This can take up to an hour. It is helpful to provide distraction to your child during this time. You may think about using a portable DVD player, books, or video games. Clean up your child and remove from the toilet. Hospital operator, 1-319-356-1616 and ask for Pediatric Surgery Resident on call.